The 1896-S is one of the three undisputed key date Barber Quarters. The Liberty head quarter design of Mint Engraver Charles Barber began production in 1892, hence its common name, the Barber Quarter. The design continued until 1916. 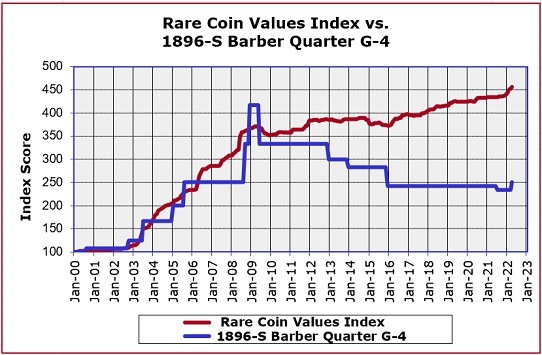 There are three undisputed key dates in the Barber Quarter series: 1896-S, 1901-S, and 1913-S. All three have outstanding records of value increases over a long period of time. While it is true the original mintage of the 1896-S is nearly five times greater than the 1913-S, there is closer parity in value. This is because between 1896 and 1913, interest in coin collecting grew significantly. When it became public that not many quarters were issued from the San Francisco Mint in 1913, collectors quickly culled the 1913-S from circulation. Thus, a much higher percentage of 1913-S quarters were saved, relative to the 1896-S. The price trend chart of the 1896-S is presented below. It has maintained pace rather nicely with the Rare Coin Values Index as a whole. The percent change in value of the 1896-S Barber Quarter is charted by the blue line above. The red line charts the progress of the Rare Coin Values Index. Both start at a baseline score of 100 in the Year 2000. The Index is made up of a cross-sectional group of 87 rare US coins. The goal of the Index is to monitor the ups and downs of the rare US coin market. The 1896-S Barber Quarter is one of the 87 coins included in the Index, and closely follows the Index trend. The Index is updated every month.